The first, and usually most important, step you must take in creating a strategic game plan is to figure out the wind. Changes in the wind direction or strength can have a huge effect on which boat comes out ahead. so before the start, try to predict what the wind will do during the first leg. If you can do this, it will be easy to figure out the favoured side of the course. In order to predict wind patterns after the start, you need to gather as much information about the wind before the start as you can. Here are some ideas. A simple way to keep track of changes in the wind is to write your compass headings for each tack in pencil on the deck. 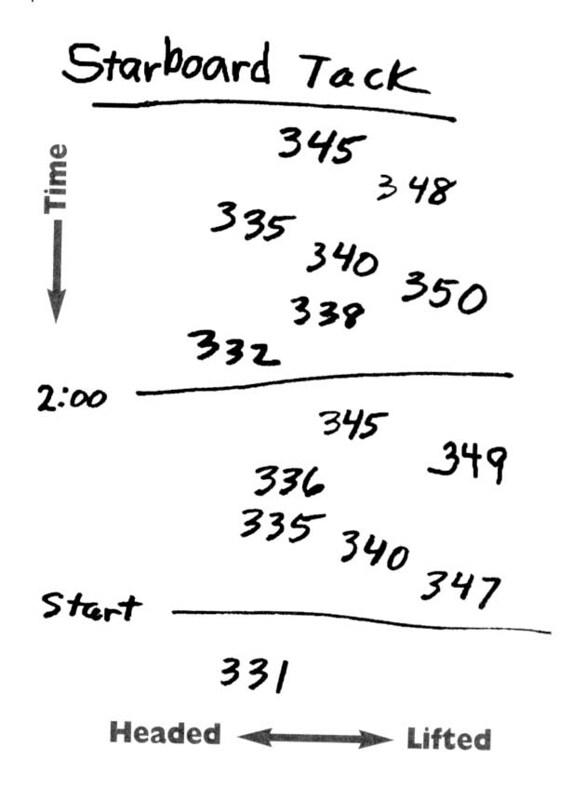 I like to write the lower numbers on the left side and the higher numbers to the right (as shown above). This way I can quickly see the range of headings on each tack. It also helps me keep track of what the wind is doing over time. � There are two basic ways to collect wind information. The first is by listening to or receiving predictions or forecasts. The second is by using your own powers of observation to gather data. � Normally, but not always, you get forecasts before you leave the dock each morning. In the U.S., these might include NOAA weather radio, the weather service that gives you forecasts by fax or e-mail. � Observations of the wind are usually made once you are sailing around in the course area. These include all the telltale clues you see (e.g. flags, clouds) as well as all the data you collect (e.g. compass numbers on each tack). � When making observations, don�t just sail around the starting area and look upwind. To get good information you should try to sail to each side of the course and experience what�s there. � A third, and very valuable, way to get information about the wind in your racing area is local knowledge. Before you go out, make sure you talk to sailors who have spent a lot of time in that racing area. This is a combination of predicted and observed information. � You should usually give more weight to your own observations than to forecasts. That�s because observations are specific to your racing area and the time of your race, while forecasts are usually quite general. For example, if the weather radio calls for the wind to shift clockwise, that may happen over the course of a day or an afternoon. But it may have nothing to do with your 15-minute first beat. � Forecasts and predictions will have less and less relevance when your races are shorter and there are more geographic effects in your racing area. The weather channel, for example, cannot know what will happen to leeward of a point of land near your windward mark. One generalization you can make about the wind is that it is almost always changing. While there are some times when you may feel certain of a predicted shift, you never know for sure. so you must always keep your head out of the boat and view each moment of the race as completely new and unique. � If you want to predict the wind, you must be proactive, not reactive. By the time you feel the wind on your neck or read it on your instruments, the shift or puff has already happened. So keep your eyes out in front of the boat. 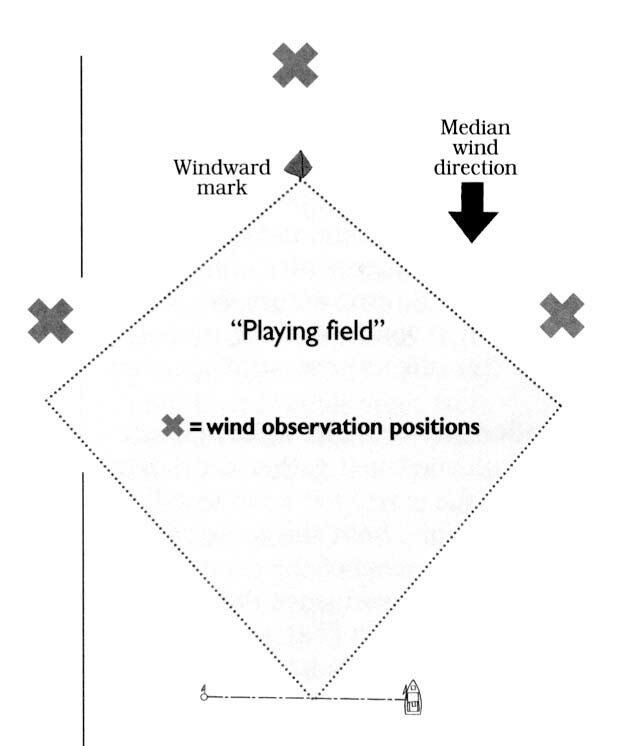 Here is one way to visually represent changes in wind direction over time. The beauty of this kind of graph is that you can extrapolate into the future and make a pretty good guess about what the wind will do next. You can create this graph with a bunch of true wind readings, or use your headings on each tack (as shown in graph 1). The darker line shows how an oscillating breeze shifts back and forth *usually fairly regularly) around a median (average) direction. The lighter line shows a breeze that is shifting persistently. That is, it shifts steadily in one direction (with small oscillations) over time. � On some days, you may not have the slightest idea of what the wind is doing. That�s OK because wind patterns are not always so obvious, even for the best sailors. In these situations, just keep watching for more clues, and stay in a position where you can take advantage of whatever happens. � Before the start, you must always assess the relative importance of wind versus other strategic factors. For example, will you go left for better wind or right for better current? Wind is usually more important because slight shifts in direction or increases in velocity can make a big difference. But this is not always the case. When you�re collecting information about the wind, there are two important considerations: 1) changes in the wind direction: and 2) changes in wind velocity. Here are some ideas for each. - Glare from the sun can sometimes make more wind look like less wind, and vice versa. - Sometimes what looks like more wind is really the effects of current. - Ripple-less water does not always mean no wind because occasionally wind stays just above the water. � When you�re trying to find shifts in direction, it�s very hard to tell much by looking at ripples on the water. you have to rely on clues like the angle of other boats sailing farther up the first leg. � The pattern of windshifts usually falls into one of two general categories - either oscillating or persistent. Before you settle on a strategic plan, one of the most important things you have to decide is whether you will play the wind shifts as oscillating or persistent. How well you make this decision throughout the race will have a lot to do with your success. � In an oscillating breeze, how much information do you need to collect about the puffs? I usually record only the range of the shifts (e.g. the high and low compass numbers) and not their timing. That�s because the range of the shifts is normally what determines when you should tack, and it�s more reliable than the timing. � Another important strategic factor is deciding on the relative importance of wind velocity versus shifts in wind direction. In other words, when you are sailing up the first beat, will you sail for better pressure or the next shift? In the 1992 America�s Cup, we had a sophisticated system for collecting wind data before each race. This included three tenders with wind instruments spread across the course (above). one boat was about a half mile to windward of the first mark, while the other two were slightly to windward of the corners of the course. Before the prep signal, all their wind data came in to a computer on America3 that displayed a running graph like the one in graph 2. A good guideline is that velocity is usually more important in lighter air while shifts are more critical in breezes. Since the wind direction and velocity are so important in your strategy, spend a good part of your time before the start collecting information about them. And don�t forget to keep doing this throughout the race as well.